Thrummed Mittens | Domesticated Human Thrummed Mittens | Online home of Crystal Flanagan. Knitter, spinner, sewer, weaver, canner, baker. Thrummed mittens may be the warmest mittens on earth. The thrums make a soft fluffy lining on the inside that helps the mittens form to your hands and give you that extra bit of protection in especially cold climates. 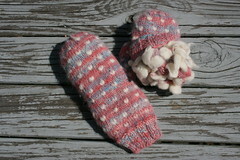 Notes: I knit the original pair of these in a handspun dk weight shown in the pictures. I later knit them again with Patons classic wool (not pictured). The pattern was written up for the Patons yarn as you can buy it. 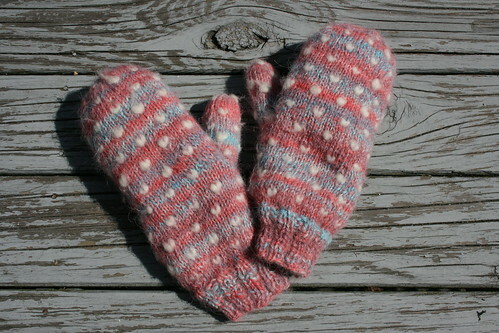 The thumb worked on these mittens is the “Afterthought Thumb”, from Elizabeth Zimmerman’s Knitters Almanac. You can substitute this out fairly easily by using the waste yarn method or any other method you prefer.